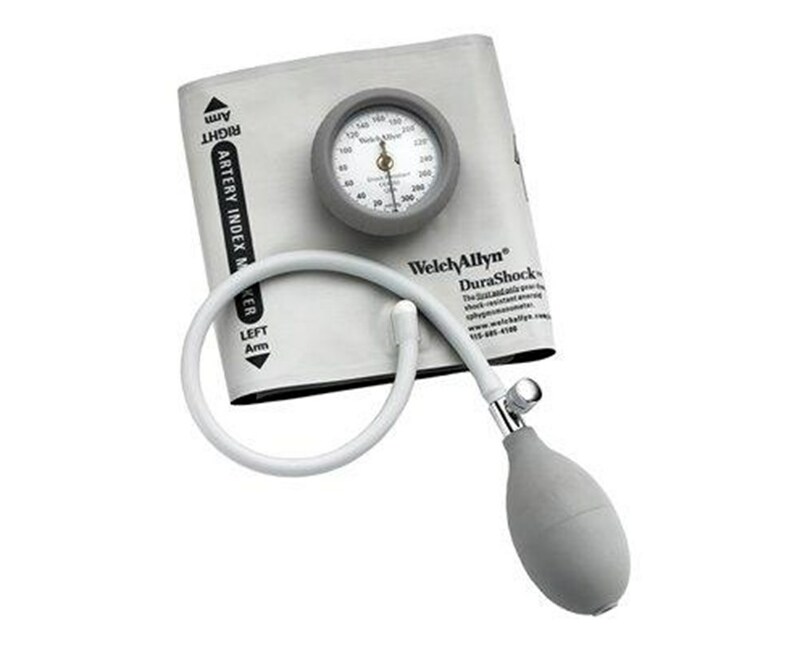 In traditional aneroid sphygmomanometer design, several delicate gears and springs convert and amplify vertical movement of the pinion to rotational movement to turn the pointer. The DuraShock™ gear-free design, however, uses a superior single helix spring to directly convert the vertical movement of the pinion to rotation of the pointer without the use of a multi-step gear arrangement. Maintain accurate blood pressure readings with lower lifetime cost with gear-free DuraShock™ technology. The Bronze Series' gauge provides unsurpassed reliability in a traditional handheld device, at a lower price to fit every budget. 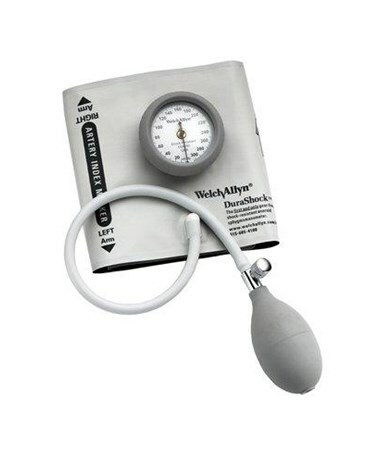 The Welch Allyn Platinum Series DuraShock™ hand aneroid sphygmomanometer is accurate to ±3 mmHg or 2% of the reading above 200 mmHg. This product will maintain the safety and performance characteristics specified at temperatures ranging from 10º C to 40º C at a relative humidity level not to exceed 90%. The super shock-resistant device can withstand up to 60" drop (twice the AAMI "Shock Resistant" standard) and remain in calibration. Its lighter-than-traditional-model weight won't weigh down your lab coat. The DS44 Integrated Aneroid features a unique integrated, cuff-mounted design that is compact and lightweight for ease of use. The gauge attaches easily with the included integrated gauge adapter and rotates 360º for easy viewing from any angle. A bumper around the dial provides added protection, and the included bladder, standard inflation bulb and high-quality air-release valve make inflation easy. Each set in the Bronze Series includes one durable, latex-free cuff with a folded edge reduces risk of cuts and scrapes for maximum patient comfort. It boasts our innovative FlexiPort™connection, which makes every cuff a one- or two-tube cuff and rotates 360º for easy viewing from any angle. The cuff is available in a wide range of sizes from child (in an optional child-friendly print) through thigh (except small adult). Use the drop-down menu in the upper right corner of this page to select a cuff.